Super-soft Bailey St. Bernard will come to the rescue whenever you need a cuddly friend to hug! Made of high-quality plush with a weighted bottom, this charming stuffed animal features floppy ears and lifelike details. Surface washable. Long on love, this St. Bernard is always ready to come to your rescue! 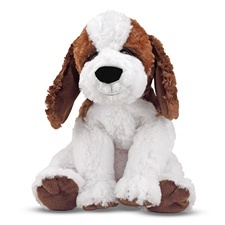 Realistic coloring and soft, silky fur make this cheerful dog an ideal friend. With more than twenty inches to cuddle between its nose and its tail, this could be your new best friend. Age rating: 2 yrs and up. Premium quality soft plush Saint Bernard slippers in a choice of sizes. Find Plush Saint Bernards for bid at Ebay.